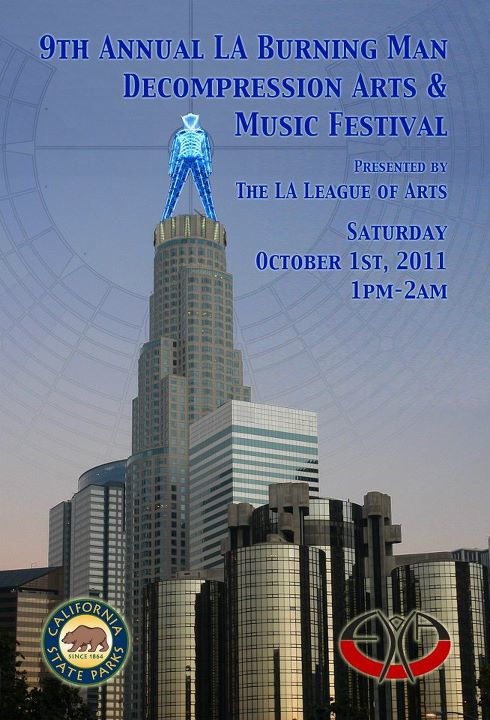 Tomorrow Oct 1 from 1-2am is the Los Angeles 9th Annual Decompression Party Saturday where you can dress up in your playa best and experience the art, music and culture of Burning Man: twelve hours of art, performance, live music, DJs, dancing­­­, theme camps, art cars, green technology, puppetry, circus, fire, and 2011 imagery all with a view of downtown LA’s skyline (and a front row seat to Occupy LA!) at the LA State Historical Park 1245 N. Spring St, Los Angeles, CA 90012. Which means that hundreds of Burners are busy volunteering their time and energy TODAY with the LA League of Arts to be ready to bring to you tomorrow. And many of us are actually camping on site tonight and tomorrow! Be sure to visit me at Art Predator’s Play House! Tell me you’re a subscriber of this blog and I will happily give you Burning Man 2011 stickers! 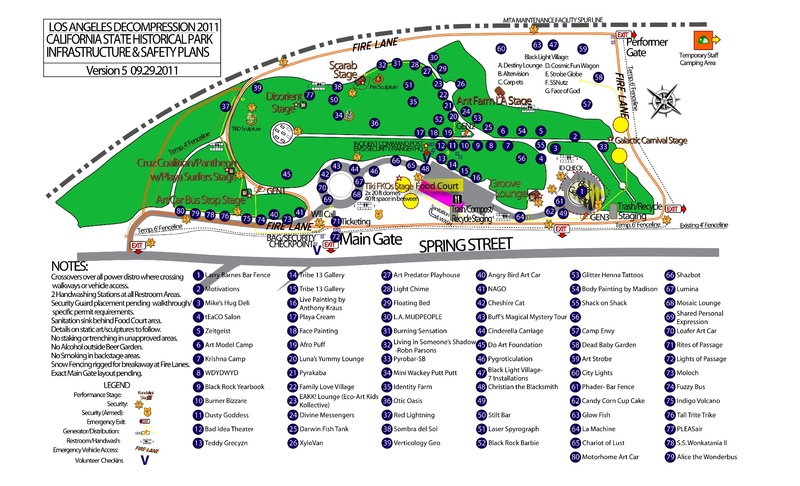 Tickets for LA Decompression are $20 at the gate. Children 12 and under get in free as do DPW, Rangers, and BM Crew with 2011 laminates. You may come and go until 6pm (State Parks rule). Before you buy your ticket and enter the event, security will search your bags for llegal Drugs, Alcohol, Weapons, Explosives, Markers, Paint, and GLOW STICKS. Avoid items that MOOP like feather boas. While pets are permitted at the park and the event, they must remain on a leash at all time and you must pick up after your pet poop is the worst MOOP!) But please don’t bring them–it’s noisy and chaotic and they really don’t belong. How to get to LA Decom: Take public transit to Union Station on Alameda or park your car there for $5 (it is the safest place to park in the area). Walk from the train station 5 blocks or ride the Metro Gold Line North from Union Station to the China Town Station one stop up the line. The entrance to the event is approximately 100 yards from the China Town Station. Burning Man Decompression, like Burning Man itself, is a “Leave No Trace” Event that encourages Radical Self Reliance, Radical Self Expression, and Radical Inclusivity. How will you contribute your creativity and energy to this community building event? ‘Growing Up at Burning Man’ – sounds like a great presentation, Gwendolyn. The whole event sounds amazing.